Choker. Mastaba D117 of Uhemka, Giza, Egypt. Egyptian. Old Kingdom, 2575-2152 BC. Faience. Lent by the University of Leipzig Georg Steindorff Egyptian Museum. The Georg Steindorff Egyptian Museum of the University of Leipzig loaned beads from an Old Kingdom broad collar and choker to the Carlos Museum for examination and restringing. 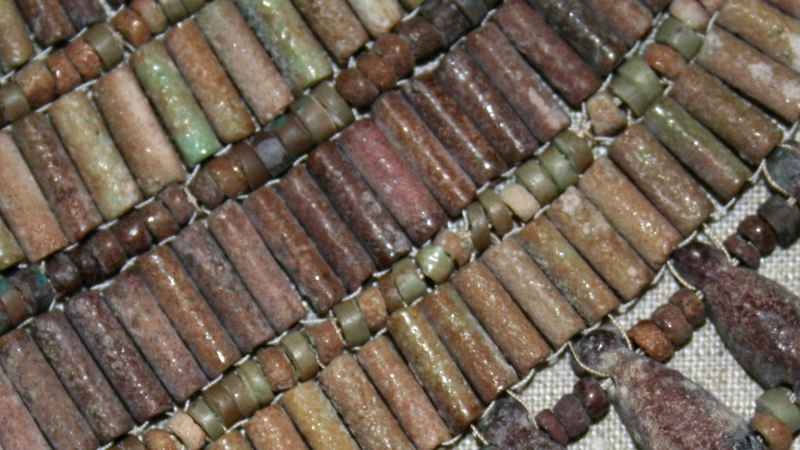 The beads exhibited significant color loss in comparison to more recent examples of faience. Emory University students Alexandra Fuller and Samantha Owens used x-ray fluorescence spectroscopy to determine the elemental composition of the beads and to infer their original color.